Just 12 More Days, But Who To Choose? Twelve! 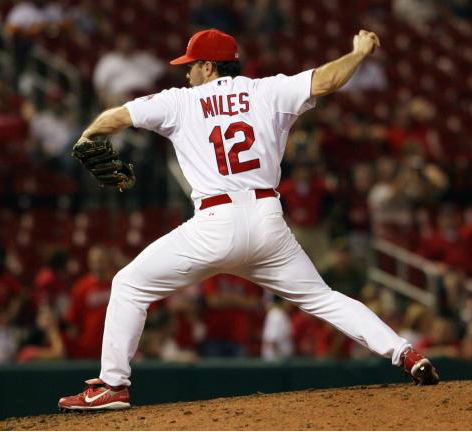 Only 12 more days until the Cardinals begin the 2015 season on ESPN’s Sunday Night Baseball against the Cubs at Wrigley Field. This day presents a dilemma, however — or at least the No. 12 does. There are plenty of 12s throughout Cardinals history, including one of my uncle Jim’s favorite players Bill White, who wore the number from 1959 to 1965 and later served as National League president from 1989 to 1994. He would definitely be worth writing about (and will be the topic of a future Throwback Thursday post). As for the dilemma, take a look at the top of this page. Yes, right there at the top of each and every page of Aaron Miles’ Fastball, each and every day, is the No. 12 of Our Namesake, a Cardinal from 2006-2008 and 2010, getting ready to deliver what certainly was an amazing (or at least adequate) heater. Remember 2011, and Game Six of the World Series (other than David Freese) in particular? Remember 2012? Remember the Twitter hashtag #LBFanClub? How can we overlook that mortal-enemy-turned-forever-hero Lance Berkman? Is there any way possible to overlook a man for whom a post called “How Do We Love Thee, Lance?” was written? Can’t be done. Thus, two No. 12s. And there is a way to tie these two together. 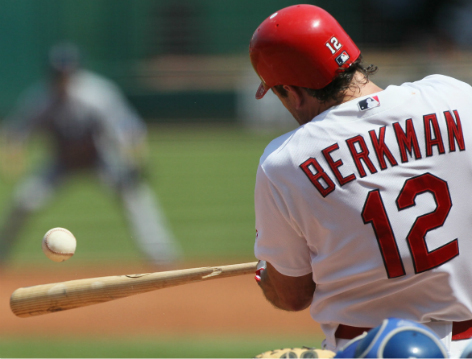 Yes, for your reading pleasure with 12 days until Opening Night, 12 things that Cardinals heroes Aaron Wade Miles and William Lance Berkman have in common. 1. Both were born in 1976, Aaron on Dec. 15 and Lance on Feb. 10. 2. Both were drafted by and signed with the Astros, Aaron in 1995 and Lance in 1997. 3. Both played for the Kissimmee Cobras of the Florida State League. 4. Both made their Major League debuts pinch-hitting against American League teams, Aaron when on the White Sox against the Twins in 2003, Lance on the Astros against the Tigers. Each had a rather inauspicious debut too, as Aaron fouled out to the catcher and Lance grounded into a double play. 5. Both placed in National League Rookie of the Year voting during their first full big-league season. Aaron was fourth in 2004 while on the Rockies (he was traded from the White Sox in December 2003 for Juan Uribe), Lance was sixth as an Astro in 2000. 6. Both appeared as designed hitters for the Cardinals, Aaron for one game in 2010 (against the Royals in 2010 — I was there!) and Lance for two games in 2011. 8. Each hit only one walk off home run in his career, Aaron against San Diego July 20, 2008, and Lance a month later, Aug. 29, 2008, against the Cardinals (and off Russ Springer, if you’re curious). But Aaron Miles’ walk off was a grand slam (and the subject of a Throwback Thursday last March, complete with video). 9. Both hit home runs off a Corey once: Lance off Colorado’s Mark Corey Sept. 10, 2002; Aaron’s aforementioned slam against San Diego’s Bryan Corey. 10. Both hit a two-run home run for the last home runs in his career, Aaron as a Dodger against former teammate and emergency Cardinals pitcher Skip Schumaker (in the previous Aaron Miles role) over the Cardinals, Aug. 23, 2011, and Lance as a Ranger against the A’s Tommy Milone, June 19, 2013. 11. Both were switch hitters. 12. Both are Cardinals World Series champions, Aaron in 2006 and Lance (obviously) in 2011. Finally, an advantage that Aaron will forever have over Lance: his five pitching appearances. Thanks to Michael Foutch for numbers 8-11. This entry was posted in 2015 Cardinals and tagged Aaron Miles, Countdown to Opening Day, Lance Berkman, LB Fan Club by Christine Coleman. Bookmark the permalink.